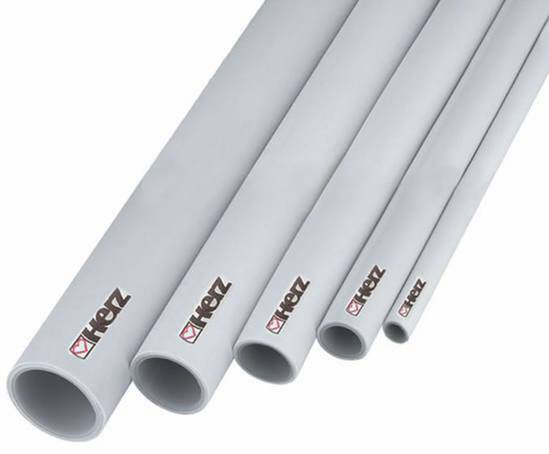 Herz plastic and aluminium composite pipes are used for underfloor heating, radiator heating and domestic water distribution. The multi-layered structure consists of a basic pipe made from polyethylene, which is covered by a seam-welded aluminium layer and covered with another layer of polyethylene. The aluminium layer offers pipe rigidity, 100% watertightness and an oxygen barrier. The pipes are supplied in straight lengths or coils and are connected using Herz press fittings or screw connections. The pipe and connection fittings are tested to standards and accredited by recognised testing centres in many European countries. The composite pipe is cost-effective and characterised by its high-quality, safety and durability. It is also completely recyclable.